Etsy Workshop — Christina Made It. 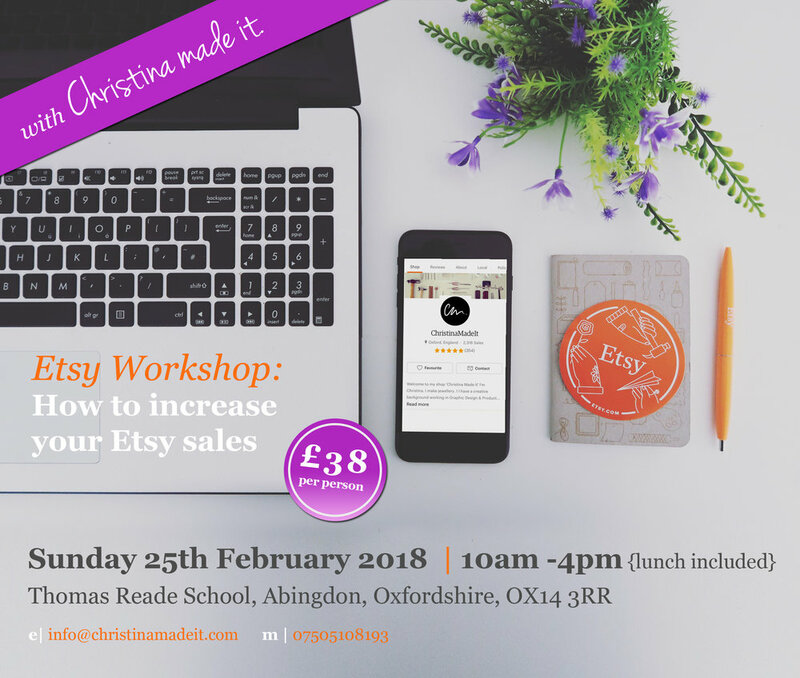 After the success of the Etsy Workshop: "How to increase your sales" in January I have decided to run a second course in February. The course is aimed at current Etsy sellers who are looking to increase their sales or improve their shops. I have a wealth of Etsy knowledge that I want to share. In my own Etsy shop Christina Made It I have made over 2,500 sales in just 3 years and now earn a full time salary from my business. Etsy Workshop: How to increase your Etsy sales. We'll look at common mistakes to avoid and tips from getting the best from your shops. I'll be holding a Q&A session at the end. After the workshop you will receive a follow up to see how you are progressing. Please note there is a limited number of spaces for this workshop so that everyone gets the best experience. "I attended Christina's Etsy Sales Workshop a couple of weeks ago. Christina is incredibly insightful and provided a lot of useful information and on going support. I am half way through my 'to do list' - Making the recommended amendments to my store as well as following other useful advice around improving SEO. I have already seen an uplift in sales and hope to see this continue as I complete all outstanding tasks. My sales in the last 2 weeks have more than covered the cost of the course so it was definitely a great investment for my business. On top of all this I have met some great new pals and we are all supporting each other as we grow our businesses together." NOTE: lunch is included in this workshop please let me know if you have any dietary requirements.